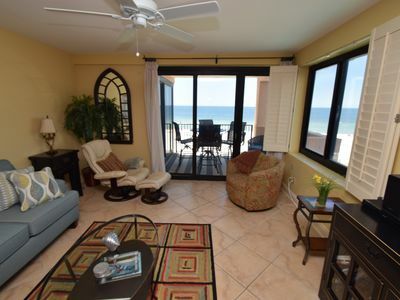 Summer House 1502B - On Penthouse Level, Beach Front Paradise Awaits! This lovely 3-bedroom top floor unit features an open-concept layout, newly remodeled kitchen and bathrooms, 16-inch tile throughout, newly updated AC system, new tankless water heater for continuous hot water, beautiful décor throughout, and gorgeous top floor views! 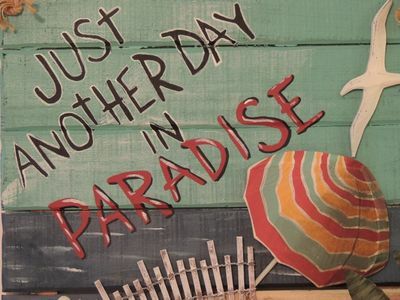 Delight in your own little slice of paradise when you visit the Summer House Resort in beautiful Orange Beach, Alabama! 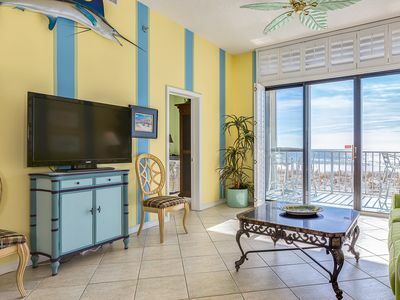 This beachfront destination boasts a myriad of amazing amenities for everyone to enjoy, and paired with its ideal location amidst the pristine shores of the Alabama Gulf Coast you’re sure to call this incredible vacation spot your new home away from home! 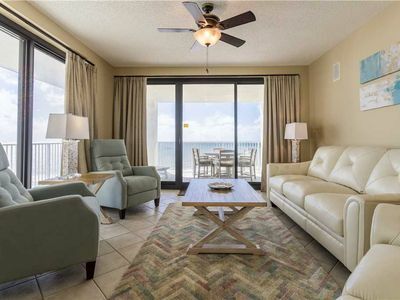 Lounge with the family for movie night in the living area, complete with comfortable furnishings including a plush sofa, two leather recliners and two additional oversize cushioned chairs, a large flat screen HDTV and beachfront balcony access! 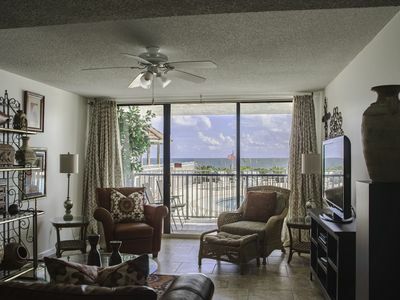 The sliding glass doors open to your covered terrace, where you can sit and enjoy the beauty and splendor of the Gulf of Mexico without leaving the comfort of your beachfront abode. 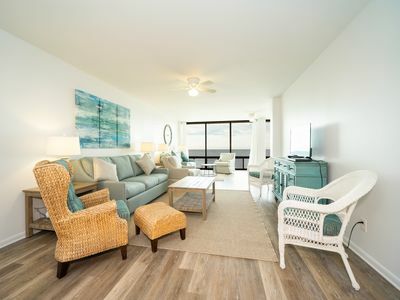 With new polywood balcony furnishings including a table and chairs and 2 loungers, you can even enjoy a delicious dinner alfresco while the hypnotic sights and sounds of the Gulf Coast lull you into a state of complete tranquility! The gourmet kitchen offers everything needed to inspire your inner-chef, featuring new top of the line stainless appliances, icemaker, floating island with granite slab, custom cabinetry and new granite countertops, plus all the small appliances, utensils and cookware needed to prepare a culinary masterpiece! The elegant dining area offers a table with high back cushioned seating for 6 where the whole family can sit down and enjoy a delicious meal and meaningful conversation, with additional seating for 2 at the breakfast bar. Retire to one of three luxuriously appointed bedrooms and catch some quality z’s during your much-deserved getaway! With each featuring premium mattress sets, posh bedding, high thread count linens and updated flat screen TVs you’re sure to indulge in some quality rest and relaxation! 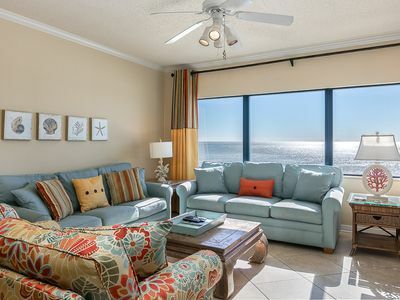 A sophisticated master suite offers a king bed with memory foam mattress, luxurious bedding and beachfront balcony access, allowing you to wake up and look out over the white quartz sands and magnificent turquoise of the Gulf of Mexico with only a few steps from your cozy bed! 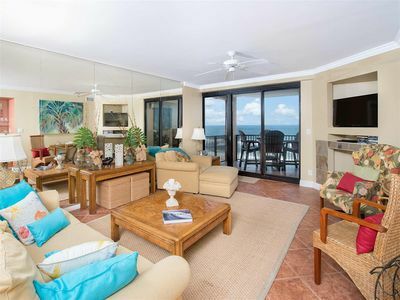 The master bath is equally impressive, including a recently remodeled walk-in glass and tile shower, granite countertops and fluffy 100% cotton oversized bath towel sets, perfect for pampering after a long day on the beach! 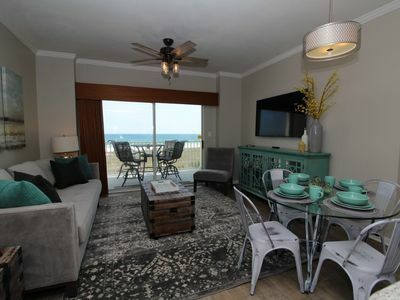 The 2nd bedroom hosts another king bed and the third offers 2 queens, and with the addition of a queen sleeper sofa in the living room this unit will accommodate up to 10 comfortably. 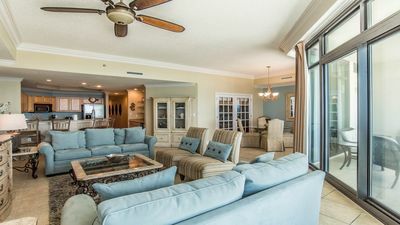 Summer House offers an array of upscale amenities, including secure gated entry, new high speed elevators, beachfront outdoor pool, indoor heated pool and hot tub, sauna, fitness center, tennis courts, putting green, basketball court, BBQ grill area and children's play area, and direct access to an expansive stretch of private beachfront! 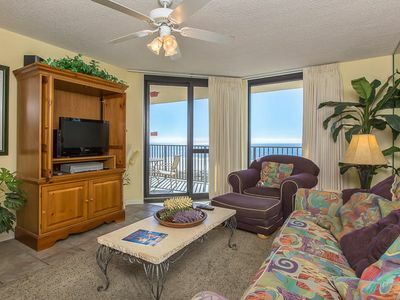 Summer House is conveniently located within walking distance to dining and shopping. 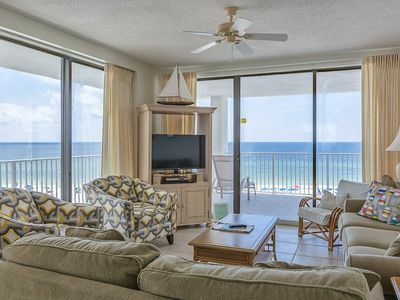 There is always something fun to do in the area, with several attractions in Orange Beach and Gulf Shores including theme parks, renowned restaurants, championship golf courses, nature walks and bike trails, adrenaline-inducing water sports, deep sea fishing charters, dolphin cruises and tons of shops and boutiques. 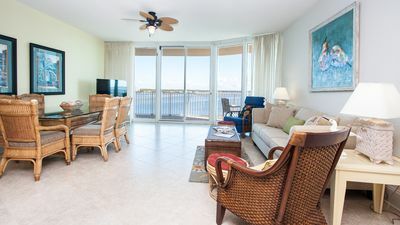 The Wharf in Orange Beach is a popular destination, hosting a number of restaurants and shops, a marina, Ferris wheel, Rave Movie Theater, zip line, laser tag and a 10,000 seat outdoor amphitheater where some of the biggest names in music perform year round. The Alabama Gulf Coast Zoo (Animal Planet’s “The Little Zoo That Could”) is highly recommended, and less than 10 miles from the resort! 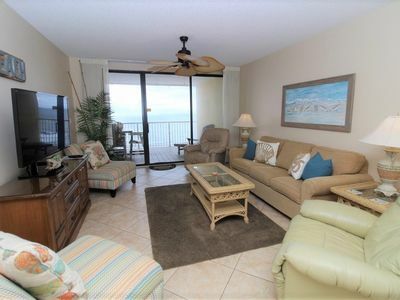 Top Floor Direct Gulf Front Condo - Best Building at Seaside-Marvelous VIEW!! Broadmoor 402 - Come Enjoy Beautiful Sunsets and Amazing Prices for Spring! 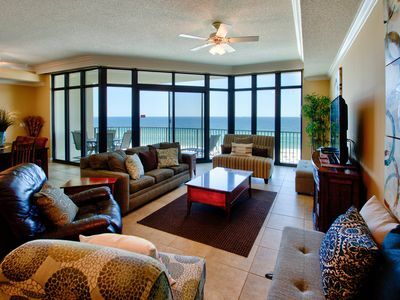 Stay and play in Orange Beach! PhxWest 506! *CALL/eMAIL TODAY! 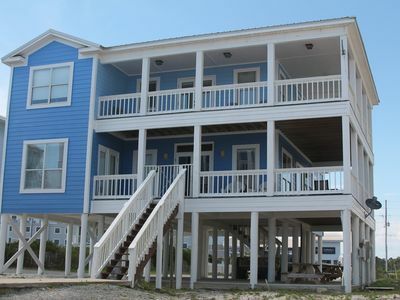 3BR/4BA Sleeps 12, LAZY RIVER! 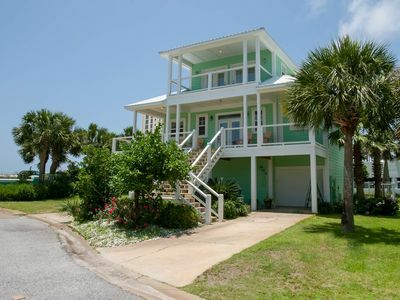 Gorgeous, Spacious Orange Beach Home! 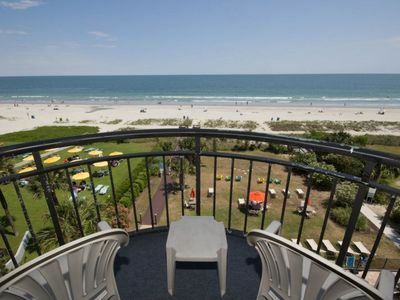 Beach & Bay Access! Pool, Walk To Dining! email for GREAT Spring rates! Penthouse unit 1505A Sleeps 12 Remodeled! 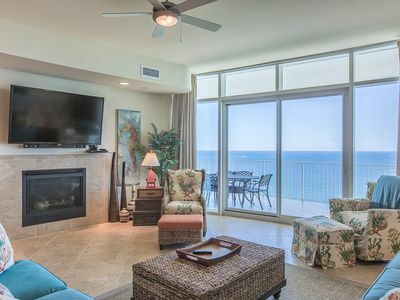 Broadmoor 205 - Amazing Gulf Front with mind blowing views, Spring break prices available now!